Nicklas Porsing could be a key man for Panthers. Speedway writer Mark Plummer takes a look at the Premier League line-up for 2016 and gives his predictions for the season ahead. The lack of an out-and-out number one is the obvious flaw of this Bandits septet. Seb Alden, Kevin Doolan, Theo Pijper and Matt Wethers are all capable members of the 30-plus brigade though and they should provide plenty of solidity with the guarantee of a high-end reserve all season. Unlikely to be enough to trouble the play-off spots though. Battle to avoid bottom spot on the cards. Key man: Thomas Jorgensen – will need to emerge as a genuine top rider to spearhead his side. The Monarchs are still to announce the identity of their compulsory British reserve, but that shouldn’t have a major impact. The loss of Craig Cook – the main man at this level during their back-to-back title triumphs – probably will though. The onus is on the likes of Australian GP wildcard and former Panthers man Ryan Fisher to pick up the slack. Key man: Ryan Fisher – Had great success in Edinburgh earlier in his career and needs to prove he is not on the wain now returning to the Scottish capital. Chequebook speedway couldn’t earn the Premier League title last season – and it probably won’t work in 2016 either. Granted Glasgow have assembled a power-packed top four, but it is offset by a tame bottom three with the reserve ranks looking particularly suspect. They should make the play-offs, but it doesn’t scream out as a title-winning septet. Key man: Fernando Garcia – he’ll have to come up with points at reserve in his first full season in the Premier League. Ipswich possess arguably the best rider in the league (Danny King) and the biggest improver (Nico Covatti). But the new-look Witches also contain a rider returning from a near-death experience (Lewis Kerr) and another under intense scrutiny for his questionable starting antics (James Sarjeant). The play-offs are a possibility, but falling short is much more likely. Key man: Lewis Kerr – Ipswich were let down by a lack support for King and Covatti last season. Kerr must ensure that doesn’t happen again. The Diamonds are another team who appear to have flexed some financial muscle during the winter. They’ve tempted Robert Lambert north after his turbulent time in Panthers colours last season while Matej Kus has made a much shorter switch from North-East rivals Redcar. Retaining big improver Steve Worrall was a smart move, but they could be found wanting at reserve. Key man: Robert Lambert – his availability will need to improve to truly showcase his ability in the Premier League. Panthers have done the speedway equivalent of weighing in for a heavyweight title fight at cruiserweight. But there is nothing flimsy and weak about their chosen septet even though it’s two points under the points limit. Panthers have three big-hitters in the making, are guaranteed to have a powerful reserve and boast strength-in-depth and potential that many of their rivals can only dream of. A fine season surely lies ahead . . .
Key man: Nicklas Porsing is the man that could turn an exciting team into a title-winning one. It looks set to be another long season of struggle in the Bears’ pit. Keeping hold of number one Lasse Bjerre and heat leader Hugh Skidmore was vital after both saw their seasons cut short by injury in 2015. The do have a potentially-decent new Danish recruit in Jacob Bukhave as well, but in all truth Nicki Pedersen would struggle to turn them into play-off contenders. 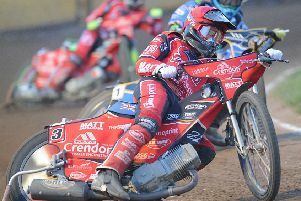 Key man: Lasse Bjerre will need to return from serious injury firing on all cylinders if the Bears are to avoid retaining the wooden spoon. It’s all change at the Rockets with only two members from last season returning. There’s also a new team boss at the helm. The end result is a mix of experience and youth, with plenty of excitement thrown in as well courtesy of newcomer Peter Karger and fellow Dane Kasper Lykke. They will be knocking loudly on the play-off door, but they might not be able to squeeze through. Key man: Cameron Heeps could be one of the signings of the winter. He had gone stale at Ipswich and will excel in Hertfordshire. A team built in a similar model to that of Panthers. They have plenty of strength in depth and will always be guaranteed a powerful reserve. But they lack the class of the city team and they will be weakened when Nicolai Klindt steps down from an early-season stint to make way for another Dane, Anders Lyager. Will be scrapping it out in the lower reaches of the standings. Key man: Alex Davies’ form took off spectacularly during a spell at reserve last season. Could become a big-hitter. A team being talked up by many pundits, but not this one. Sheffield have already seen number one Simon Stead hurt in the Ben Fund Bonanza – his first meeting back from almost 11 months out – and that won’t do potentially fragile confidence any good. Jason Garrity is another able rider, but Josh Bates and Dimitri Berge must both prove they can shine in the main body of the team while Richard Hall will need to put some frustrating years behind him at reserve. Key man: Richard Hall could be an influential figure this term. Somerset have picked up at least one trophy in the last four seasons, but may find it tough to continue that sequence. Rohan Tungate was poor guesting for Panthers in the play-off semi-finals whereas the improvement of Charles Wright and Paul Starke may well be at an end. New recruits Jake Allen, a promising Aussie, and Bradley Wilson-Dean, a Kiwi star of the National League last season, must hit the ground running. Key man: Wilson-Dean was exceptional in the third tier last term, but has to step up in the Premier League. The Comets could really be flying high in 2016. They have a powerful unit as top-end strength and the reserve scoring potential of Adam Roynon offsets a slight question mark in the middle order. Nailed on to be in the play-offs at least, but may well top the standings if the scope for plenty of improvement from plenty of riders is realised. Key man: Mason Campton sat out British speedway last season and could take time to adjust. He may drop to reserve early on and will need to be on his game.